Our relationship with the entertainment industry is like a wild fire. It spreads quickly, devours resources, and once started, it can be almost impossible to keep in check. Does it have to be harmful? Well, no. Not if you’ve done the work to keep it contained. But that’s difficult to do, and it requires forethought. Remember Smoky the Bear’s famous line, “only you can prevent forest fires?” What would he think of today’s over-abundance of entertainment-seekers, many of whom can’t put their devices down even when they’re out for an afternoon hike? Attempting to keep up with the latest experiences, newest phone apps, the smartest phone s, gaming platforms, and technology can certainly make one’s head spin like Linda Blair’s in The Exorcist. Yikes! And because of the evolving entertainment industry, albeit not to blame them, we have somehow lost our ability along the way to be intentional with our use of entertainment. Being intentional means being deliberate in the choices you make in the type, amount, and kind of entertainment you use. But while you’re scrolling through Facebook, rolling your eyes or LOL, grab the popcorn because this reading is going to be entertaining! Life has become one big entertainment experience from dusk ‘til dawn, literally. It’s no wonder we can’t focus, concentrate, stay on task, or get adequate sleep because our minds are constantly divided between the real world and fantasy. When was the last time you weren’t multitasking? Can you even get through a show on Netflix without pulling up your social media newsfeed on your phone or taking a whirl at the latest level of Candy Crush or Trivia Crack? Let’s not even get into the litany of social improprieties suffered as a result of being bombarded with entertainment options. For example, failing to acknowledge your server who has approached your table to take your order. It’s like a nightmare and we’re being chased by Pokémon and his entourage of monsters. Have we become victims of our own devices? Nobody likes to think of themselves as a victim, but honestly, we really have to ask ourselves, “Is the amount of time I spend with entertainment a problem?” And maybe more importantly, how can you tell? If you’re using entertainment more often than not as a way to escape from your emotional world or to avoid responsibilities altogether, I’d say there’s likely a problem. For instance, are you having Netflix binges on a regular basis? Or neglecting your home because you have to be at the latest event, coolest restaurant, or upcoming concert? Is there anything wrong with that? Well, it all comes down to intention. Some people might set aside hours in a day for an entertainment activity they’ve been looking forward to. They plan for it. It is intentional, and they are present. But getting sucked in isn’t something you do with intent. It’s not you being in charge—it’s you checking out and letting your entertainment be mindless, not mindful. There isn’t anything inherently wrong with entertainment. It has been around for centuries, after all. The methods have changed, but the motivation has remained the same: a bit of escapism and a way to relax outside the daily drudge. But our access to entertainment has reached unprecedented levels, and it’s time to dial it back. Entertainment is meant to be fun. It shouldn’t leave you feeling numb, depleted or guilty. So how do you approach entertainment with intention? By putting yourself back in the driver’s seat. 1. Create boundaries. If you’re at work, you should probably be working. But if you get a few breaks and a lunch and you want to play Pokémon Go, then have at it. I see this one a lot...people at dinner on their phones. When eating, put your phone away. Let your guest know that they’re important and a priority. It’s amazing how much time gets lost when you’re picking up your phone every 5 minutes. And turn off those flippin’ notifications, they’re so distracting and time consuming! 2. Escape reality with intention. Instead of watching your favorite TV series while working on a project around your home, sit down on something comfy, grab a beverage and maybe a snack, and focus on the show. If the TV series is something you enjoy, then make it a priority and schedule it out. 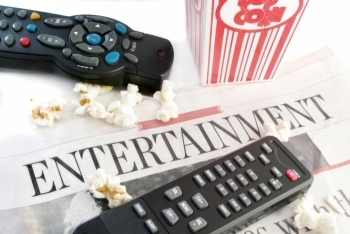 Record your shows and watch them later when you can devote your undivided attention. You’ll be glad you did. ﻿4. Don’t allow entertainment to consume your life. If the amount and time you spend with your entertainment of choice is impacting your work, relationships, and mental health, then it’s likely a problem. If you’re curious how much time you spend with entertainment, record the time and activities you do in a given week. I bet you’ll be surprised! 5. Take a break. If you feel your entertainment use is out of control, take some time away and re-calibrate and come back with a game plan. Most people who take some time away report feeling glad that they did. Sometimes just separating from entertainment for a brief time can be a grounding experience. Entertainment should be fun, exhilarating at times, satisfying and fulfilling. It is supposed to give us some respite from the monotony of life. Our use of entertainment doesn’t have to feel like a possession, and if it does, then it’s possible you’re misappropriating the purpose of entertainment. Take some time to re-evaluate your use of entertainment and reflect on ways you might be able to use entertainment more intentionally. And P.S., if Pokémon starts talking to you and chasing you, then we should probably talk!